A disappointed Ian Bell and agressive Mitchell Marsh. This was very much the story for their sides today. Melbourne Cricket Ground, Melbourne, Australia. The Australians, decimated the Engishmen in front of a packed Melbourne crowd of 85,00 people, in their first encounter in the group stage. They registered an emphatic win of 111 runs over the Three Lions, who completely looked out of sorts and were no match for the fiery Kangaroos. England won the toss and put the hosts into bat, and over the course of the game, were outclassed by them in each of the departments. The Australians received an early blow in the 8th over of the match as ace opener David Warner was bowled by Broad's yorker and they were 57-1. England missed a few chances early in the innings by dropping Finch and Warner, and had to pay a heavy price for it. Receiving a life when he was on 0, Aaron Finch grabbed the opportunity with both his hands and went on to score a magnificent 135 off 128 balls smashing 12 fours and 3 sixes. Shane Watson departed for a duck being caught behind by Haddin off Broad and it was followed by Smith returning to the pavilion too on a score of 5, as the Australia and were wobbling at 70-3 in the 11th over of the innings. After this George Bailey and Finch on the other end capitalized putting on a partnership of 146 runs, as the England bowling went from bad to worse. Finch was run out by a sharp direct hit from Captain Morgan and soon Bailey also returned to the pavilion contributing an important 55 runs to the total. This brought Glenn Maxwell and Mitchell Marsh on the crease who smashed the England bowlers to the cleaners adding to their woes. Known for his innovative hits all around the ground Maxwell took each bowler one by one and seemed to be unstoppable. Marsh too joined the party before he was dismissed for 23 by Finn in the 46th over. Haddin who came in at number 8 for the Aussies joined Glenn Maxwell and added insult to injury to the Three Lions. He played a cameo hitting 31 runs off just 14 balls before smashing a ball in the air off Finn which landed into the hands of Broad, who completed a wonderful catch. It was too late for the Englishmen to mend things as the Aussies had already cruised to a mammoth 342 but Steven Finn had something special to offer. He first dismissed Haddin, which was followed by claiming Maxwell on 68 who hit the ball high over the bowlers head and landed in the hands of Root, and his third prey was Mitchell Johnson. He got the first hat-trick this World Cup, that too on the opening day. The English bowling card had nothing really worth to display. Woakes who was decent in the tri-series picked up only one-wicket and gave away 65 runs. Anderson went wicketless with an economy of 6.70 in his 10 overs, while Broad claimed two scalps although leaking 66 runs. The spin of Moeen Ali and Joe Root bore no fruit except contributing 77 runs to the Australian total. 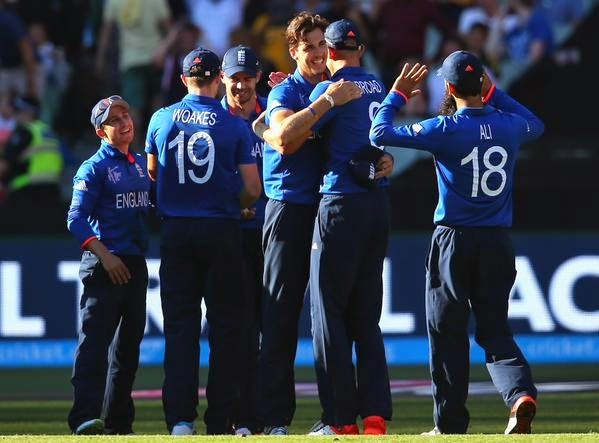 The England batting seemed to have driven inspiration from their dismal bowling. With their current batting form it was unlikely that they would chase down the humongous total but it turned out to be even more ludicrous. Their batting was opened by Moeen Ali and Ian Bell. The former departed on 10 bringing Garry Ballance to the crease, who too left the ground on the same score flicking a short to mid-wicket., followed by Bell being dismissed on 36 leaving England to a fearful 66-3 in the 14th over. The very next ball after Ian Bell was back in the pavilion, Joe Root top-edged a ball into the gloves of the keeper and Mitchell Marsh was on a hat-trick. He missed it but later made Eoin Morgan his fourth prey who fell for a 4th duck in the recent days, nicking a slow paced short delivery into safe hands of Haddin, and this made matters even more hurtful for the English fans. Jos Buttler, who was the saviour for England in the recently concluded tri-series, too had a short stay on the pitch, lasting for only 12 deliveries, and this brought Chris Woakes to the crease. James Taylor along with Chris Woakes tried to put some air into the already deflated and battered sails of England batting. They together shared a 92 run stand for the 7th wicket, until Woakes was surprised by a fast paced delivery from Johnson and hit it into the hands of Smith. Broad and Finn too did not last long and were blown away by Johnson for 0 and 1 respectively. James Taylor showed some character and heroics on the field and tried his best to at least make his team reach a respectable score, if not the target, however he did not have good enough batsmen on the other end to complement him. He missed out on well deserved century as James Anderson on the other end was given out after quite a lot of drama. Taylor tried to whip a ball off Hazelwood, and was given out lbw after which he went for a review. The ball was missing leg and the umpire changed his decision to not out. On the other hand Anderson was trying to sneak a single, and was run out by Glenn Maxwell. Out, review, not out and finally out. 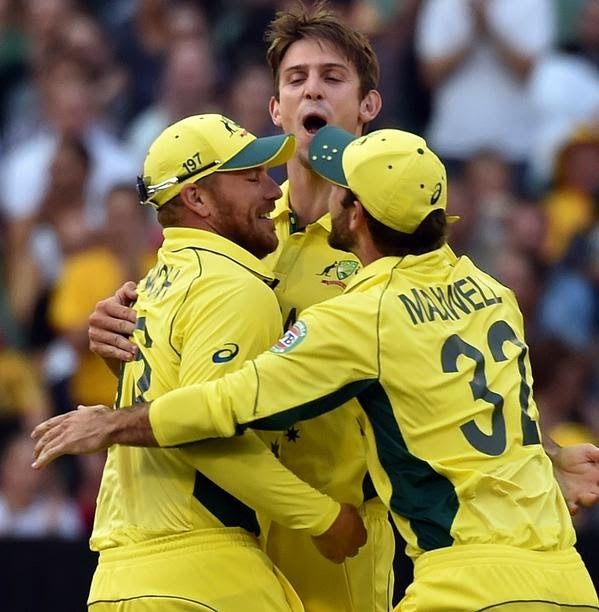 The Australian bowlers were pumped up both it pace and discipline. One would expect Mitchell Johnson or Mitchell Starc to fire, but it was Mitchell Marsh's day who bagged five wickets. Starc claimed 2 for 47 in his 9 overs while Johnson had 2 wickets to show against his name for 36 runs in his quota of 8 overs. The Australian fielding was spot on and England succumbed to a side who were absolutely perfect in executing their plans. The Aussie pace attack proved to be too good for the Engllish batsman which is why they crumbled for a mere 231. First encounter of the extravaganza on their home soil and the Australians came out all guns blazing and registered two points straight away. Throughout the match they did not put a step wrong, be it any of the three departments which is why they were successful in overshadowing their arch rivals England, who were in complete muddle. As the match progressed the English were inching towards a nightmare owing to their below average performance in batting, bowling and fielding. Ravi Bopara who was a regular face in the England ODI side was excluded today which came as a surprise. Even Alex Hales's experience was not taken into consideration in the playing XI. For Australia it was a 'Mitchell' Monopoly at Melbourne which was very well complemented by a spectacular show put up by Finch and Maxwell. Even the fielding department was charged up and the stunner which Steven Smith grabbed to remove Jos Buttler was a fine example. If Australians continue going this way then they are not too far from triumphing for the fifth time although its too early to predict. England on the other hand need to pull up their socks to ensure it doesn't prove to be a terrible season for them. 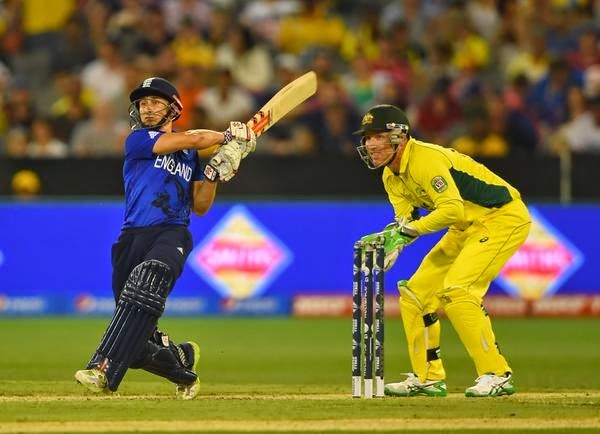 The opening night of the 2015 Cricket World Cup proves to be an amazing one. Australia triumph and look for home-soil advantage as they march on. 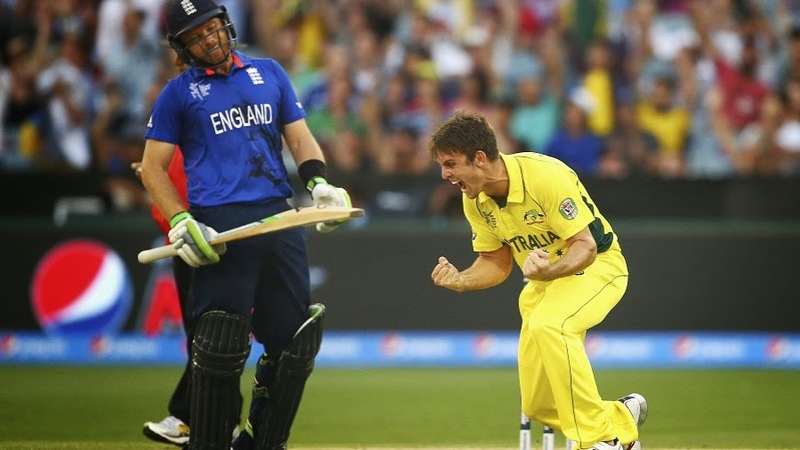 England succumb to the charged up Australians in the second game of the 2015 Cricket World Cup.